Introducing the world’s first wireless rechargeable Bluetooth tracker. Keep it in your wallet, purse, handbag or just about anything you cannot afford to lose. Charging pad also works with compatible phones and watches. Our Classic Bluetooth tracker is the same size as a credit card so it fits neatly in your wallet or anything else you can't afford to lose. The Limited Edition Clear Card is printed with the sequential edition number. See inside the card and the thin tech that makes up our Recharge Card. The World’s First Wireless Charging Bluetooth Tracking Card. Find your misplaced items fast. Perfect to Place in Your Wallet, Purse, Passport or Backpack. 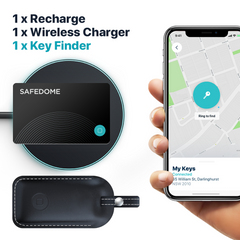 Combo pack with ONE Recharge Card, ONE Wireless Charging Pad and ONE Premium Leather Key Finder Bluetooth Tracker. 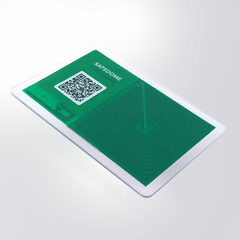 The World’s First Wireless Charging Bluetooth Tracking Card, Perfect for Your Wallet, Purse, Passport. Find your misplaced items fast. Premium Leather Key Finder Perfect for Your Keys, Luggage, Bag or Backpack. Key Finder has Replaceable battery.